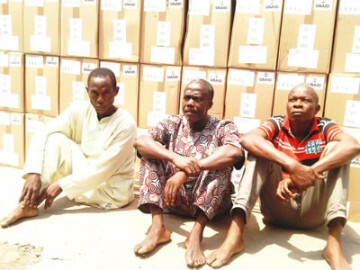 The police in Lagos State have arrested 3 suspected thieves, Emmanuel Onyike, 51; Alabi Daudu, 68; and Paul Aina, 58 for allegedly diverting a container loaded with pharmaceutical drugs, valued at N40m, to the Igando area of the state. It was gathered that the suspects were apprehended by the operatives of the Special Anti-Robbery Squad attached to Zone 2, on Saturday, July 18. According to the police, the container, which belonged to the United States Agency for International Development, was heading for a warehouse of the Society for Family Health in Sango Ota, Ogun State. It was, however, hijacked and diverted by the suspects to a secluded warehouse in Igando, where the suspects reportedly planned to sell the contents. Our correspondent gathered that about 500 cartons of drugs, which the container was conveying, had been recovered by the police. It was learnt that other members of the syndicate, identified only as Ikechukwu, Babawale, Shola and Alhaji, were still at large. “Babawale was a friend, and he was the one who brought the deal. He told me he had some goods, and I should get him a truck to convey them. I knew it was stolen goods, but I did not know they were USAID drugs. “We drove from the Tin Can Port to an area in Igando. Babawale deceived me that the truck contained household batteries. He did not let the three of us know the warehouse. Also, Aina from Itapa, Ekiti State, and father of six children, said Daudu lured him into the act, adding that his own role was to get buyers for the goods.